Sufism is a contemporary expression of a perennial wisdom that leads to direct experience of Divine Reality. The various Sufi Orders (Tariqas), represent different chains of transmission (Silsila) passed down through theTeacher (Sheikh).The word 'Sufi' comes from the Arabic 'suf' meaning wool. A devotional, philosophy of the heart, Sufism is 'the way of the mystic'. 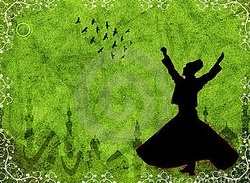 To be a Sufi is to be 'lost in the company of those lost in God', when ones heart has become as warm and soft as wool. If you would like your teacher or group to be included in this section please contact us. There are more than 70 practising spiritual faiths and paths in Glastonbury and many more individuals that have developed their own paths that have helped them explore the Divine. Listings here are offered for information only and are not intended to be an endorsement or recommendation. If meeting with individuals, please exercise common sense and employ personal safety guidelines. We cannot guarantee accuracy of information regarding timings and events. Where times and/or events are included in a listing, please avoid disappointment and check with the organisation before visiting. The Dances of Universal Peace were brought together in the late 1960's by Samuel L. Lewis (1896-1971), a Sufi Murshid (teacher) and Rinzai Zen Master, who also studied deeply in the mystical traditions of Hinduism, Judaism, and Christianity. In this creation, Lewis was deeply influenced by his contact and spiritual apprenticeship with two people -Hazrat Inayat Khan, who first brought the message of universal Sufism to the West in 1910 and Ruth St. Denis, a feminist pioneer in the modern dance movement in America and Europe. Open meditation meetings and dream work held Fridays 8.00 pm. All welcome, no charge. Open Zikr (Sufi chanting- meditation) First Sunday of the Month 5.00pm St Margaret's Chapel, Magdalene Street.